Dr. Hendricks is the only Women’s Clinical Specialist within 90 miles of Greater Cincinnati. She has more than 8 years of experience in evaluating and treating women’s and pelvic health conditions and specialization in treating all forms of pelvic pain and pelvic floor dysfunctions that have not responded to other forms of treatment, such as medication, surgery, or physical therapy elsewhere. Initial Evaluation: 60 min of thorough history taking and extensive physical examination with holistic approach of performing full body orthopedic assessment for strength, flexibility, and postural and body mechanics. All office visits are one to one in a private room with a doctor of physical therapy specializing in women’s and pelvic health. Patients see the same physical therapist every visit. Individualized treatment plans are based on current scientific research and focus on achieving YOUR goals and empowering you to independently manage your health. Treatments may include hands-on manual therapies such as trigger point dry needling, myofascial release, muscle energy techniques, and joint mobilization, neuromuscular re-education, pilates-based core muscle stabilization training, EMG biofeedback, relaxation training, electrical stimulation, patient education to improve posture, body mechanics, and bowel and bladder hygiene behavior. Physicians referrals are accepted but are not required for physical therapy. Cancellation/No-show fee: There will be a fee applied if a visit is canceled with less than 24 hours’ notice or if a client fails to attend a scheduled visit. Dr. Hendricks provides comprehensive pelvic floor physical therapy for women of all ages, including those who self-refer, or those who are referred by another provider. As a direct pay provider, Dr. Hendricks eliminates the obstacle of third-party payers (she is unable to see Medicare patients,) creating a direct financial relationship with patients. This model allows for pricing that is far lower than typical out-of-pocket cost to patients when charges are submitted to insurance. 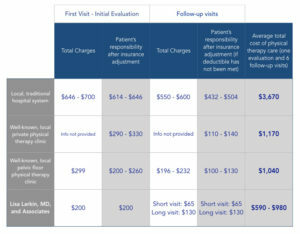 Initial new patient (1-hour) consultation is $200, and follow-up visits are $130 for 60 min or $65 for 30 min (length of follow up visits are dependent upon the unique needs of each patient). Out of town intensive pelvic health program: individually customized program consisting of Initial Evaluation and multiple follow-up sessions performed on consecutive days. This program is ideal for individuals with complex cases, those who have not responded well to previous pelvic health PT, or those who do not have access to pelvic health services within their own geographical region. Telehealth follow-up visits (via phone call or video chat) are available for these individuals. Please call for more information. HSA or FSA accounts may be used as a form of payment (as permitted by your plan). Many patients have success with full or partial reimbursement of their costs through submission of physical therapy receipts to their insurance provider. We are happy to provide detailed paperwork and receipts. *Due to federal regulations, out-of-network physical therapists are not permitted to provide care to Medicare recipients.